ANPR (Automatic Number Plate Recognition) cameras are being used to create a "24x7 national vehicle movement database" that will log the movement of every vehicle on the United Kingdom's roads. Your every move will be retained in the system for two years. According to an article in The Register, the system will go live in April of next year and will process 50 million number plates per day by year's end. ANPR camera systems are to be placed every 400 yards along motorways. Besides "denying criminals the use of the roads", the system will also link to other databases to identify vehicles that are unregistered and untaxed. The system will be used in the war on terror; UK police have lobbied for detention periods of up to 90 days without charges for terror suspects. Once police have a tip or a suspect in custody, they can sift records of vehicle movement along with everything else. This technology was predicted sixty years ago by Robert Heinlein in his 1941 novel Methuselah's Children. The novel takes place in a near-future Earth society that is very closely regulated. The individual's right to privacy typically means little compared to the right of society to take what it needs from citizens. For example, the movement of every vehicle on the road is monitored by roadside cameras, just like it will be in Britain. Some individuals, however, use other technology to maintain their privacy. Take a look at IP Cameras - Larry Niven's Webeye? for another science-fictional surveillance technology that seems to have arrived. 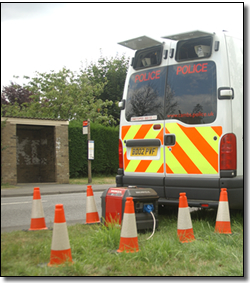 Or, read more about the vehicle movement database and the ANPR system.